Since her debut at Carnegie Weill Recital Hall in New York as an accompanist, Dr. Sarah Tocco has maintained an active concert career both as a soloist and an ensemble pianist. As a concerto competition winner, she has performed with California State University Symphony in Los Angeles and Moor Park College Symphony in California. She was invited on a full scholarship to Manchester Music Festival in Vermont for two summers, where she studied with world renowned pianist Eugene List. Dr. Tocco has collaborated with numerous chamber ensembles and vocal ensembles throughout the New England area as well as in New York, California, and around the world. As both a soloist and a collaborative pianist, Dr. Tocco has performed in countries such as Brazil, Cuba, Russia, Vietnam, Italy, and Jamaica, as well as locally to New Orleans. She made highly-lauded solo appearances at the Manaus Opera House in Brazil, the Opera House at Haiphong, Vietnam, and the International House of Music in Moscow, Russia. 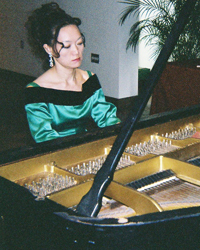 Especially in Russia, as the first American pianist to perform at the International House of Music, she mesmerized the audience with her performance of their beloved composer, Rachmaninoff. Known for her lyrical and expressive tone and sensitivity in Romantic music, her CD of music by Chopin, Brahms, and Schubert has been described as "beautifully moving" and a "wonderful rendition of Brahms with depth and insightful interpretation." Dr. Tocco's performance has been broadcast on local cable television in the Dedham and Westwood areas. In addition to being a faculty member at Winchester Community Music School and former director of the school's Summer Chamber Music Festival, Dr. Tocco serves as music director at First Parish of Westwood and has been a guest lecturer at UMass Lowell and Northeastern University, as well as a regular lecturer at Brookline Adult Community Education. She holds a Doctor of Musical Arts degree in Piano Performance from Boston University.